Cachexia, or wasting syndrome, is loss of weight, muscle atrophy, fatigue, weakness and significant loss of appetite in someone who is not actively trying to lose weight. Cachexia is seen in people with cancer, AIDS, coeliac disease, chronic obstructive pulmonary disease, multiple sclerosis, rheumatoid arthritis, congestive heart failure, tuberculosis, familial amyloid polyneuropathy, mercury poisoning (acrodynia), Crohn’s disease, untreated/severe type 1 diabetes mellitus, anorexia nervosa, hyperthyroidism and hormonal deficiency. It is a positive risk factor for death, meaning if the person has cachexia, the chance of death from the underlying condition is increased dramatically. It can be a sign of various underlying disorders; when a patient presents with cachexia, a doctor will generally consider the possibility of adverse drug reactions, cancer, metabolic acidosis, certain infectious diseases (e.g., tuberculosis, AIDS), chronic pancreatitis and some autoimmune disorders. Cachexia physically weakens patients to a state of immobility stemming from loss of appetite, asthenia and anemia, and response to standard treatment is usually poor. Cachexia includes sarcopenia as a part of its pathology. The term is from Greek κακός kakos, “bad”, and ἕξις hexis, “condition”. Cachexia is often seen in end-stage cancer, and in that context is called cancer cachexia. Patients with congestive heart failure can have a cachectic syndrome. Also, a cachexia comorbidity is seen in patients who have any of the range of illnesses classified as chronic obstructive pulmonary disease. Cachexia is also associated with advanced stages of chronic kidney disease, cystic fibrosis, multiple sclerosis, motor neuron disease, Parkinson’s disease, dementia, HIV/AIDS and other progressive illnesses. About 50% of all cancer patients suffer from cachexia. Those with upper gastrointestinal and pancreatic cancers have the highest frequency of developing a cachexic symptom. This figure rises to 80% in terminal cancer patients. In addition to increasing morbidity and mortality, aggravating the side effects of chemotherapy, and reducing quality of life, cachexia is considered the immediate cause of death of a large proportion of cancer patients, ranging from 22% to 40% of the patients. Cachexia has been reported in patients with early-stage cancer and its presence is associated with mortality risk. The exact mechanism in which these diseases cause cachexia is poorly understood, but there is probably a role for inflammatory cytokines, such as tumor necrosis factor-alpha (which is also nicknamed ‘cachexin’ or ‘cachectin’), interferon gamma and interleukin 6, as well as the tumor-secreted proteolysis-inducing factor. The inflammatory cytokines involved in wasting diseases are interleukin 6, TNF-alpha, IL1B, and interferon-gamma. Although many different tissues and cell types may be responsible for the increase in circulating cytokines during some types of cancer, evidence indicates the tumors are an important source. Cytokines by themselves are capable of inducing weight loss. TNF-alpha has been shown to have direct catabolic effect on skeletal muscle and adipose tissue and produces muscle atrophy through the ubiquitin–proteasome proteolytic pathway. The mechanism involves the formation of reactive oxygen species leading to upregulation of the transcription factor NF-κB. NF-κB is a known regulator of the genes that encode cytokines, and cytokine receptors. The increased production of cytokines induces proteolysis and breakdown of myofibrillar proteins. The treatment or management of cachexia depends on the underlying causes, the general prognosis and other person related factors. Reversible causes, underlying diseases and contributing factors are treated if possible and acceptable. Therapy that includes regular physical exercise is recommended for the treatment of cancer cachexia due to the effects of exercise on skeletal muscle. Individuals with cancer cachexia generally report low levels of physical activity and few engage in an exercise routine, owing to low motivation to exercise and a belief that exercising may worsen their symptoms or cause harm. As of 2018,[update] the efficacy of resistance and aerobic exercise in cancer cachexia has not been established due to a lack of published evidence; however, trials of the effectiveness of exercise therapy – in combination with nutrition and medication – are underway. A growing body of evidence supports the efficacy of β-hydroxy β-methylbutyrate (HMB) as a treatment for reducing, or even reversing, the loss of muscle mass, muscle function, and muscle strength that occurs in cachexia; consequently, as of June 2016[update] it is recommended that both the prevention and treatment of muscle wasting conditions include supplementation with HMB, regular resistance exercise and consumption of a high-protein diet. Progestins such as megestrol acetate are a treatment option in refractory cachexia with anorexia as a major symptom. Cachexia occurs less frequently in HIV/AIDS than in the past due to the advent of highly active antiretroviral therapy (HAART). Treatment involving different combinations for cancer cachexia is recommended in Europe, as a combination of nutrition, medication and non-drug-treatment may be more effective than monotherapy. Non-drug therapies which have been shown to be effective in cancer induced cachexia include nutritional counselling, psychotherapeutic interventions and physical training. Anabolic-androgenic steroids like oxandrolone may be beneficial in cancer cachexia but their use is recommended for maximal 2 weeks since a longer duration of treatment increases the burden from side effects. Medical marijuana has been allowed for the treatment of cachexia in some US states, such as Illinois, Maryland, Delaware, Nevada, Michigan, Washington, Oregon, California, Colorado, New Mexico, Arizona, Vermont, New Jersey, Rhode Island, Maine, and New York  Hawaii and Connecticut. New studies indicate NSAIDS, like Sulindac, were found to significantly decrease cachexia in mice. Also studies have shown branched-chain amino acids can return the metabolism of a cachectic patient from catabolic (losing weight) to anabolic (increasing muscle) in over 55% of patients. Branched-chain amino acids consist primarily of leucine and valine. In a research paper published by the Indian J of Palliat Care, the effects the findings concluded that bcaa’s interfere with brain serotonergic activity and inhibit the overexpression of critical muscular proteolytic pathways. The potential role of branched-chain amino acids as antianorexia and anticachexia agents was proposed many years ago, but experimental studies and clinical trials have since tested their ability to stimulate food intake and counteract muscle wasting in anorectic, weight-losing patients. In experimental models of cancer cachexia, BCAAs were able to induce a significant suppression in the loss of body weight, producing a significant increase in skeletal muscle wet weight as well as in muscle performance and total daily activity. According to the 2007 AHRQ National Inpatient Sample, in a projected 129,164 hospital encounters in the United States, cachexia was listed as at least one of up to 14 recorded diagnosis codes based on a sample of 26,325 unweighted encounters. A sample of 32,778 unweighted US outpatient visits collected by the CDC’s National Ambulatory Medical Care Survey did not list any visits where cachexia was one of up to three recorded diagnoses treated during the visit. ^ Rapini, Ronald P.; Bolognia, Jean L.; Jorizzo, Joseph L. (2007). Dermatology: 2-Volume Set. St. Louis: Mosby. p. 1169. ISBN 978-1-4160-2999-1. ^ Meresse B, Ripoche J, Heyman M, Cerf-Bensussan N (January 2009). “Celiac disease: from oral tolerance to intestinal inflammation, autoimmunity and lymphomagenesis”. Mucosal Immunology. 2 (1): 8–23. doi:10.1038/mi.2008.75. PMID 19079330. ^ Lainscak M, Podbregar M, Anker SD (December 2007). “How does cachexia influence survival in cancer, heart failure and other chronic diseases?”. Current Opinion in Supportive and Palliative Care. 1 (4): 299–305. doi:10.1097/SPC.0b013e3282f31667. PMID 18685379. ^ Bossola M, Pacelli F, Doglietto GB (August 2007). “Novel treatments for cancer cachexia”. Expert Opinion on Investigational Drugs. 16 (8): 1241–53. doi:10.1517/13543784.16.8.1241. PMID 17685872. ^ a b c d Ebner N, Springer J, Kalantar-Zadeh K, Lainscak M, Doehner W, Anker SD, von Haehling S (July 2013). “Mechanism and novel therapeutic approaches to wasting in chronic disease”. Maturitas. 75 (3): 199–206. doi:10.1016/j.maturitas.2013.03.014. PMID 23664695. ^ Payne C, Wiffen PJ, Martin S (January 2012). “Interventions for fatigue and weight loss in adults with advanced progressive illness”. The Cochrane Database of Systematic Reviews. 1: CD008427. doi:10.1002/14651858.cd008427.pub2. PMID 22258985. ^ Fearon KC, Moses AG (September 2002). “Cancer cachexia”. International Journal of Cardiology. 85 (1): 73–81. doi:10.1016/S0167-5273(02)00235-8. PMID 12163211. ^ Alhamarneh O, Agada F, Madden L, Stafford N, Greenman J (March 2011). “Serum IL10 and circulating CD4(+) CD25(high) regulatory T cell numbers as predictors of clinical outcome and survival in patients with head and neck squamous cell carcinoma”. Head & Neck. 33 (3): 415–23. doi:10.1002/hed.21464. PMID 20645289. ^ Brown JC, Caan BJ, Meyerhardt JA, Weltzien E, Xiao J, Cespedes Feliciano EM, Kroenke CH, Castillo A, Kwan ML, Prado CM (August 2018). “The deterioration of muscle mass and radiodensity is prognostic of poor survival in stage I-III colorectal cancer: a population-based cohort study (C-SCANS)”. Journal of Cachexia, Sarcopenia and Muscle. 9 (4): 664–672. doi:10.1002/jcsm.12305. PMC 6104108. PMID 29766660. ^ a b c Kumar NB, Kazi A, Smith T, Crocker T, Yu D, Reich RR, Reddy K, Hastings S, Exterman M, Balducci L, Dalton K, Bepler G (December 2010). “Cancer cachexia: traditional therapies and novel molecular mechanism-based approaches to treatment”. Current Treatment Options in Oncology. 11 (3–4): 107–17. doi:10.1007/s11864-010-0127-z. PMID 21128029. ^ Garcia JM, Garcia-Touza M, Hijazi RA, Taffet G, Epner D, Mann D, Smith RG, Cunningham GR, Marcelli M (May 2005). “Active ghrelin levels and active to total ghrelin ratio in cancer-induced cachexia”. The Journal of Clinical Endocrinology and Metabolism. 90 (5): 2920–6. doi:10.1210/jc.2004-1788. PMID 15713718. ^ Martignoni ME, Kunze P, Friess H (November 2003). “Cancer cachexia”. Molecular Cancer. 2 (1): 36. doi:10.1186/1476-4598-2-36. PMID 14613583. ^ DHHS, 2009. “Care Management Guidelines Fatigue, Anorexia and Cachexia” (PDF). Archived from the original (PDF) on 2014-05-14. Retrieved 23 February 2014. ^ Grande AJ, Silva V, Riera R, Medeiros A, Vitoriano SG, Peccin MS, Maddocks M (November 2014). “Exercise for cancer cachexia in adults”. The Cochrane Database of Systematic Reviews (11): CD010804. doi:10.1002/14651858.CD010804.pub2. PMID 25424884. ^ Grande AJ, Silva V, Maddocks M (September 2015). “Exercise for cancer cachexia in adults: Executive summary of a Cochrane Collaboration systematic review”. Journal of Cachexia, Sarcopenia and Muscle. 6 (3): 208–11. doi:10.1002/jcsm.12055. PMC 4575551. PMID 26401466. ^ Ferioli M, Zauli G, Martelli AM, Vitale M, McCubrey JA, Ultimo S, Capitani S, Neri LM (March 2018). “Impact of physical exercise in cancer survivors during and after antineoplastic treatments”. Oncotarget. 9 (17): 14005–14034. doi:10.18632/oncotarget.24456. PMC 5862633. PMID 29568412. ^ Wasley D, Gale N, Roberts S, Backx K, Nelson A, van Deursen R, Byrne A (February 2018). “Patients with established cancer cachexia lack the motivation and self-efficacy to undertake regular structured exercise”. Psycho-Oncology. 27 (2): 458–464. doi:10.1002/pon.4512. PMID 28758698. ^ a b Solheim TS, Laird BJ, Balstad TR, Bye A, Stene G, Baracos V, Strasser F, Griffiths G, Maddocks M, Fallon M, Kaasa S, Fearon K (September 2018). “Cancer cachexia: rationale for the MENAC (Multimodal-Exercise, Nutrition and Anti-inflammatory medication for Cachexia) trial”. BMJ Supportive & Palliative Care. 8 (3): 258–265. doi:10.1136/bmjspcare-2017-001440. PMID 29440149. ^ a b Brioche T, Pagano AF, Py G, Chopard A (August 2016). 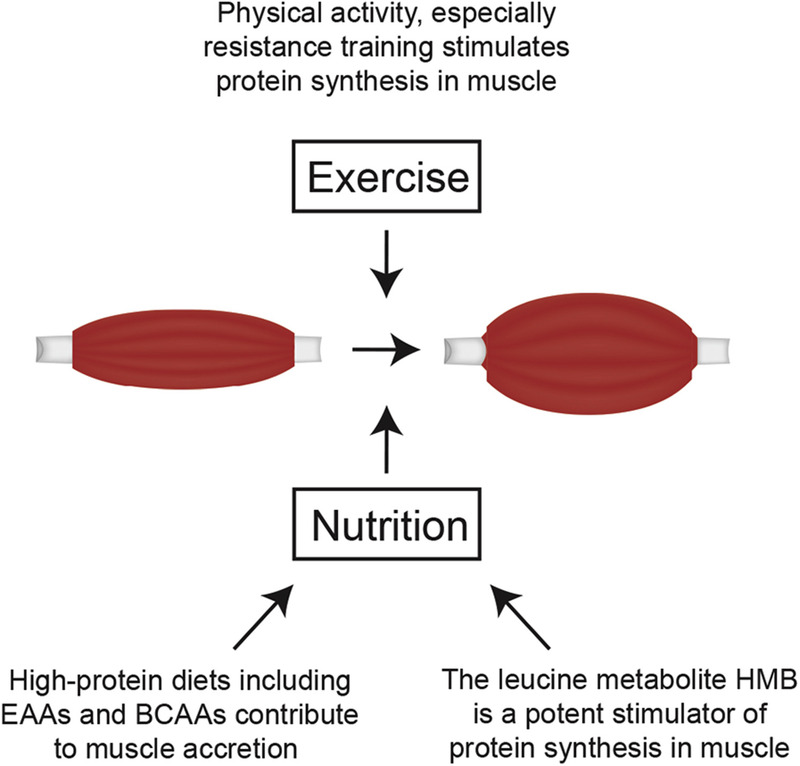 “Muscle wasting and aging: Experimental models, fatty infiltrations, and prevention”. Molecular Aspects of Medicine. 50: 56–87. doi:10.1016/j.mam.2016.04.006. PMID 27106402. In conclusion, HMB treatment clearly appears to be a safe potent strategy against sarcopenia, and more generally against muscle wasting, because HMB improves muscle mass, muscle strength, and physical performance. It seems that HMB is able to act on three of the four major mechanisms involved in muscle deconditioning (protein turnover, apoptosis, and the regenerative process), whereas it is hypothesized to strongly affect the fourth (mitochondrial dynamics and functions). Moreover, HMB is cheap (~30– 50 US dollars per month at 3 g per day) and may prevent osteopenia (Bruckbauer and Zemel, 2013; Tatara, 2009; Tatara et al., 2007, 2008, 2012) and decrease cardiovascular risks (Nissen et al., 2000). For all these reasons, HMB should be routinely used in muscle-wasting conditions especially in aged people. … 3 g of CaHMB taken three times a day (1 g each time) is the optimal posology, which allows for continual bioavailability of HMB in the body (Wilson et al., 2013). ^ Mullin GE (February 2014). “Nutrition supplements for athletes: potential application to malnutrition”. Nutrition in Clinical Practice. 29 (1): 146–7. doi:10.1177/0884533613516130. PMID 24336486. There are a number of nutrition products on the market that are touted to improve sports performance. HMB appears to be the most promising and to have clinical applications to improve muscle mass and function. Continued research using this nutraceutical to prevent and/or improve malnutrition in the setting of muscle wasting is warranted. ^ a b c d e f g h i European Palliative Care Research Collaborative. “New European Guidelines: CLINICAL PRACTICE GUIDELINES ON CANCER CACHEXIA IN ADVANCED CANCER PATIENTS”. Retrieved 23 February 2014. ^ a b Gagnon B, Bruera E (May 1998). “A review of the drug treatment of cachexia associated with cancer”. Drugs. 55 (5): 675–88. doi:10.2165/00003495-199855050-00005. PMID 9585863. ^ Marcia Nelms; Kathryn P. Sucher; Karen Lacey; Sara Long Roth (16 June 2010). Nutrition Therapy and Pathophysiology. Cengage Learning. pp. 766–. ISBN 978-1-133-00809-5. ^ Giovanni Mantovani (6 October 2007). Cachexia and Wasting: A Modern Approach. Springer Science & Business Media. pp. 673–. ISBN 978-88-470-0552-5. ^ a b Suzuki H, Asakawa A, Amitani H, Nakamura N, Inui A (May 2013). “Cancer cachexia–pathophysiology and management”. Journal of Gastroenterology. 48 (5): 574–94. doi:10.1007/s00535-013-0787-0. PMC 3698426. PMID 23512346. ^ “About the Medical Marijuana Program”. ^ “Medical Marijuana Registry Program | Eligible Debilitating Medical Conditions”. health.hawaii.gov. Retrieved 2016-04-27. ^ Yavuzsen T, Davis MP, Walsh D, LeGrand S, Lagman R (November 2005). “Systematic review of the treatment of cancer-associated anorexia and weight loss”. Journal of Clinical Oncology. 23 (33): 8500–11. doi:10.1200/JCO.2005.01.8010. PMID 16293879. ^ Dewey A, Baughan C, Dean T, Higgins B, Johnson I (January 2007). “Eicosapentaenoic acid (EPA, an omega-3 fatty acid from fish oils) for the treatment of cancer cachexia”. The Cochrane Database of Systematic Reviews (1): CD004597. doi:10.1002/14651858.CD004597.pub2. PMID 17253515. ^ Ries A, Trottenberg P, Elsner F, Stiel S, Haugen D, Kaasa S, Radbruch L (June 2012). “A systematic review on the role of fish oil for the treatment of cachexia in advanced cancer: an EPCRC cachexia guidelines project”. Palliative Medicine. 26 (4): 294–304. doi:10.1177/0269216311418709. PMID 21865295. ^ a b c Argilés JM, Busquets S, López-Soriano FJ (September 2011). “Anti-inflammatory therapies in cancer cachexia”. European Journal of Pharmacology. 668 Suppl 1: S81–6. doi:10.1016/j.ejphar.2011.07.007. PMID 21835173. ^ “Brown fat found to be at the root of cancer-related wasting syndrome”. ^ May PE, Barber A, D’Olimpio JT, Hourihane A, Abumrad NN (April 2002). “Reversal of cancer-related wasting using oral supplementation with a combination of beta-hydroxy-beta-methylbutyrate, arginine, and glutamine”. American Journal of Surgery. 183 (4): 471–9. doi:10.1016/s0002-9610(02)00823-1. PMID 11975938. ^ “Glutamine”. WebMD. WebMD, LLC. Retrieved 2015-03-15. ^ “Redirect – NAMCS/NHAMCS – Homepage”. 2019-01-29.